The house is a 2 bed semi detached, 2 ensuite bathrooms upstairs and a further cloakroom downstairs. We have our own private garden with parking area and a private swimming pool. This is a superior, modern villa in an excellent location on the outskirts of Paphos, in the village of Peyia near to Coral Bay. 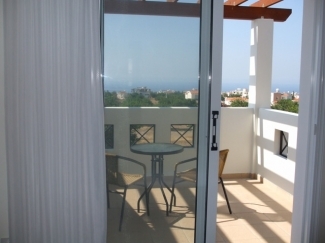 The villa is close to supermarkets, bakery, bank and pharmacy and a few restaurants and local taverns. The village centre is an approximate 15 minute walk away with more shops and restaurants there, including a butchers and a fresh fish store. The nearby, picturesque Paphos harbour is an idyllic venue in which to enjoy local fish and Cypriot meze or take part in the many marine and sports excursions on offer. A few minutes drive leads to the popular and sought-after resort of Coral Bay, which has a wealth of quality amenities and a beach for the discerning holidaymaker. This excellent two-story, spacious villa is stylishly decorated. It has an open plan living room, dining room and well-equipped kitchen. The well furnished living room and dining area are light and bright, with patio doors leading to the terrace and swimming pool with rattan and wooden outdoor furniture. The lounge is equipped with a TV and DVD/Music player with an assortment of DVD�s and CD�s for you to use. 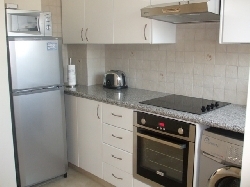 There is a modern and well-equipped kitchen, with everything necessary for a self catering holiday. Villa Bembridge has two good sized bedrooms, both en suite with built-in wardrobes, on the first floor. 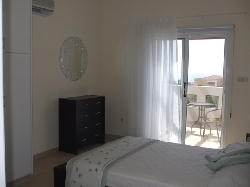 The master bedroom has a double bed, an en-suite bathroom and a large balcony with patio furniture and sea views. There is a further bedroom on this floor with twin beds and the other en suite bathroom. Both bedrooms have floor standing fans for those who prefer those to air conditioning. There is a further toilet downstairs. Villa Bembridge can accommodate 4 people in the existing bedrooms and a further two people on the fold out leather sofa bed. 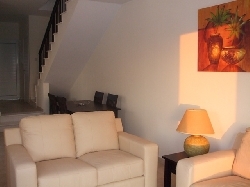 Villa Bembridge has air conditioning available throughout. The villa has a large private garden with a patio that has a shaded area that overlooks the 8x4 meter swimming pool and together with dining furniture with a gas barbecue, makes an excellent venue for al fresco dining on glorious Cyprus evenings. You can sit on the comfortable couch and watch the sun set over the sea. The pool is entered by metal steps, has an adjacent poolside shower and is surrounded by a sunbathing terrace with comfortable cushioned wooden sun loungers. Includes cleaning, linen and towels and a welcome pack.